A couple years back I found a beautiful, hand-thrown Guy Wolfe flowerpot in a curb pile. Then, I did something stupid: I left it outside over the winter. And in the spring, I found it broken into a bunch of pieces. Major bummer, but a valuable lesson learned. 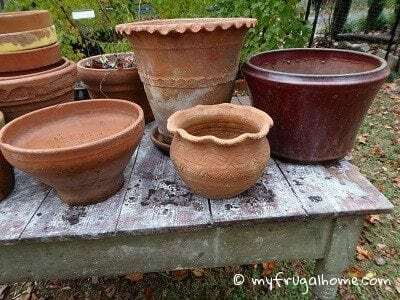 Now, I gather all of my flowerpots up ahead of the first hard frost, and I store them in the garage until spring. It doesn’t take long to do, and it helps to ensure that my pots will be around for years to come.